Designers observe, but anthropologists and sociologists trained in ethnography observe and pay a great deal of attention to the theories they use and develop while they do so. The EPIC conference, this year in its fourth iteration in Copenhagen, brings together those working in organizations for whom ethnography is central to their practice. They might be called designers, design anthropologists, ethnographers, or simply researchers. They might work in product development, in marketing, in strategy/futures, or in usability testing, depending on the organization, its industry practices and its maturity. EPIC brings these practitioners together with academics like me who are interested in the kinds of data that are gathered, or rather created, in the pursuit of organizational goals. As well as ethnographers from Intel, Microsoft and Yahoo, there were many from the (Danish) public sector and from design and research consultancies such as IDEO, live|work, and ReD Associates. Conferences are hard work. Many are dull. The organizers of this one (this year chaired by Melissa Cefkin of IBM Research and Martha Cotton of gravitytank) paid a great deal of attention to the design of our experience as participants. There were not many sessions where we sat and listened to papers, though we did. There was a breakfast session at which we could go round to listen to people doing a show and tell of their artefacts. There was a future-facing session in which three influential people with visions of the future of ethnographic practice in organizations had their ideas acted out by the organizational theatre company Dacapo. In my closing keynote Reassembling the Visual (PDF) I drew on Science and Technology Studies/Actor-Network-Theory to argue that ethnography should pay attention to the practices of contemporary artists and designers, who in my reading, assemble the social as described by Latour in Reassembling the Social (2005). I described projects by Anna Best (PHIL, 2002) and Chris Evans (Radical Loyalty, 2002-) and my own project Physical Bar Charts (2005-), a version of which was installed in the foyer at EPIC. I argued that these projects involve data gathering and organize people and objects into sets of relations, creating accounts of human experience in novel ways that social scientists should pay attention to. 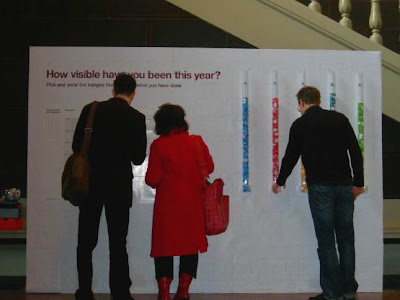 In the Physical Bar Charts at EPIC, people could help themselves over the three days to badges as a way of answering the question 'How visible have you been this year?' (the conference theme being (in)visibility). The badge that was most popular was 'I made mistakes' - one important way of being visible, that it appears quite a good number of EPIC participants can tolerate being public about. The other badges were: 'I acted then thought'; 'I thought then acted'; and then 'I used Powerpoint'. The fifth badge - 'I saw the big picture' - was least taken/popular/visible, obviously not something people want to make claims about, this year anyway. Here's the flickr site with participants photos. Multidisciplinary research projects being in fashion with academic funders, I was able to spend a couple of days at a project incubator workshop organized by one of the clusters supported through the Digital Economies initiative led by the Engineering and Physical Sciences Research Council. This brought together computer and social scientists, art and design practitioners and academics, and people from companies that design and make digital technologies to develop projects together that are concerned with health, transport and the creative industries. I took part in a number of conversations, in particular one concerned with researching the idea of a digital nexus for a post-car future, drawing on work by John Urry. Initiated by Monika Buscher, Daniela Sangiorgi and other colleagues from Lancaster University, this is an ambitious idea that seeks to develop and test product and service ideas, and policies, that are a preferable scenario for the future of a digital media economy enabling mobility.